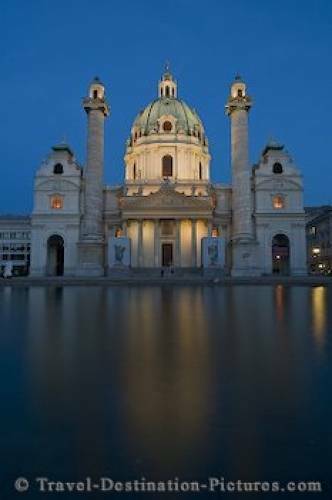 The Karlskirche with night reflections in downtown Vienna, Austria, Europe. Residing at the one end of the Karlspatz is the Karlskirche - one of the most beautiful churches in Vienna. A big pool in front of it allows photographers to capture this church with water reflections - at night and in blue hour it's a very pleasant view. The Karlsplatz itself is a meeting point for different people like skaters, bookreaders and lovers.